I have always had a love/hate relationship with fan art. In one way, I enjoy celebrating my favorite movies/books/TV shows by making art inspired by them (you know I can never resist a good Frozen or Song of the Sea doodle). In another respect, I feel like fan art is unproductive for me. After all, I could be spending that time working on my own projects, rather than just indulging in someone else’s fantasy. Recently, I’ve been thinking of my book/illustration work as my own sort of fan art: fan art that I create based on my ideas and creations. A book, after all, could be considered fanfic that one person makes of the ideas swimming around in their head. Which is not to say that my work is so amazing that it deserves fan art. It’s not. Certainly not to me, who works on each book for years. Years. Which can sometimes lead me to feel a bit stuck. Trapped even. So I thought, if I’m here anyway, why not enjoy the view? Celebrate it even? It’s an interesting way to approach working on my books. It engenders a mentality of cheering myself on, getting excited about the worlds and characters I create, and letting that enthusiasm spill into the work itself. Thinking of the work as “fan art” or “fanfic” also necessitates that I be a fan of my own work. Which is far easier said than done for me. Too often, I am critical and judgmental of my work, rarely taking time to step back and just enjoy it, much less say “wow, this took a lot of hard work, I’m proud of this.” Just typing those words makes me laugh. In some ways, letting myself be a fan of my own work is an act of faith. A symbol of belief. A belief I so rarely feel. The belief that this is not all complete and utter garbage, that the book is worth finishing, that there is something magical and fantastic in there worth celebrating. Even if it’s a little thing. Oftentimes, I have to find a single idea that I like. Just one. I can then hold that idea up as proof, to tell myself “see, this is worth all your time and hard work.” A lot of writing (and painting), at least for me, is telling myself that it is worth it. That it is not all worthless bosh. And neither am I. I know, I have frighteningly low self-esteem, especially when it comes to my work. But that’s one thing that always pushes me to be better. To work harder. Practice more. But that mentality isn’t healthy. At the very least, it’s only effective in small doses. Too much negativity and self-chastisement and I get bogged down. And that, more than anything, is what causes my creative blockages. My own mindset. The good news, however, is that mindsets can be changed. It might take time and practice, but you’ll get there. Choosing to treat yourself gently and with kindness can be difficult at first. I still struggle with it daily. That’s why oftentimes, it’s easier to start with one thought. Say, “I get to write fanfic of these interesting characters in my head!” instead of “I have to make myself write at least one scene today,” or what have you. If I can see my creative work as an enjoyable opportunity, rather than a difficult obligation, or a task I’ll never measure up to, I’m much more likely to produce better work. It’s the whole carrot vs. stick scenario. And we all know that carrots are much healthier than sticks. Unless perhaps you’re a beaver. Be nice to yourself. You deserve it. As does your imagination. Give your own creative ideas just as much value and power as you give to your favorite books/movies/TV shows/etc. if not more. They deserve it. After all, your favorite book started out as just an idea in someone’s head. Same with every movie, TV show, comic, song, etc. They were all just ideas once, that someone believed in and honored with their hard work and time. You are capable of incredible things. And I say that in full knowledge of the literal meaning of the word. Something that you can’t believe. Not yet, anyway. You are stronger than you think, more creative than you let yourself believe, and capable of more than you’ve ever imagined. I believe in you. What will you create? I am a huntress of rare grace. A pursuant of everyday beauty. A seeker of hidden inspiration. Take me to the beach, and I’ll walk the shore for hours, looking for pretty seashells. In the forest, I’m like to pick up golden acorns and lacy leaves, stowing them in my coat pockets for later. Even in rest stop meadows, I’ll gather honey-scented clovers to tie into chains and crowns, leaving them for passersby. Beauty and inspiration hide everywhere, I’ve found. And what joy is the hunt! Online image resources like Google Images or Pinterest can seem far removed from a forest or shell-strewn beach at first glance. Yet they also hide great treasures, provided you’re willing to hunt for them. How fortunate we artists and creatives are, to live in an age of information and online image databases. My first boss, a kind mountain man and great nature painter, had filing cabinets full of images and photos he’d cut out of magazines, nature guides, and books over the years. So if he asked me to paint a diamondback rattlesnake (I painted museum casts all throughout high school), I had to dive into the cabinets, wading through folder after folder in order to cull just a few pertinent reference images. One day I dug into the filing cabinets to find reference pictures of a certain type of tree frog, only to discover an enchanting photo of a hawk (thus fueling a years-long obsession with raptors). Now, all I have to do is type my query into Google or Pinterest. Some say that we have lost the magic of accidental discoveries all for the sake of convenience. I would argue the contrary. Silly though it may seem, I generally start an illustration (or even piece of writing) with a cursory image search, usually both on Google Images and Pinterest. Not only does this reveal what’s already out there, but shows what’s been done before, and how. Sites like Pinterest can also be useful for observing current trends, a feature I made great use of when I worked in commercial fabric design. But I distrust trends. A) because they won’t last (especially in areas like publishing), so that by the time you’ve “caught up” and tailored your style to match current fashions, the trends will have moved on and more importantly because B) your work and style should be your own, made for your own pleasure and edification, not to please an invisible and ever-changing market. It seems a simple thing to say, yet it took me years to truly learn. That said, I do like to see how others across the world have interpreted a concept. I like to keep my searches simple and broad: a few key words (such as “summer twilight,” “Arctic forest,” or “yew tree”), which I can then refine further if need should arise. Google Images and Pinterest also allow you to search or browse through related images, a feature I find myself using frequently. Often I find treasures buried in the related images (though sometimes four or five tiers down). Maybe my keywords weren’t specific enough, or perhaps searching in English limited the results (I do search in other languages from time to time, such as when doing research for my picture book set in Arctic Norway, I’ll usually search in Norwegian). Of course, as anyone who has used Pinterest (or similar sites) before knows, there is always the danger of falling down the rabbit hole. I admit to falling into this trap numerous times (especially when researching book things or reference images, since I can tell myself I’m “doing work” even though I’m not being productive in the slightest). And sometimes those journeys into the Deep Dark Pinning Depths (which I imagine to look something like the depths of Moria) do result in a rare gem that sparks inspiration, but more often than not, I find that it’s yet another disguise for procrastination. I also enjoy watching documentaries while I paint or listening to TED talks. Netflix has a wonderful selection of science and nature documentaries that often give me new ideas or perspectives for the project at hand. Similarly, I’ve found that if I’m actively engaging different parts of my brain while I paint (even if it’s trying to keep up with a TED talk on neuroscience), it helps deepen my experience of painting and view the work from new internal angles. Or at least bring different ideas and perspectives into the work. Yet my greatest source of inspiration is always nature itself. A walk in the woods is my creative panacea. Every time, I find it leaves me refreshed and renewed, and even if it’s hasn’t left me with a jolt of inspiration, it has created a calm and welcoming environment, so that when inspiration visits later, it will feel so at home it might stay a while. Inspiration is hiding all around you. You have but to open yourself to the presence of wonder, the possibility of beauty in all things. As my series of little village paintings comes to an end, I thought I’d take this opportunity to give you a peek into my process for one of them. 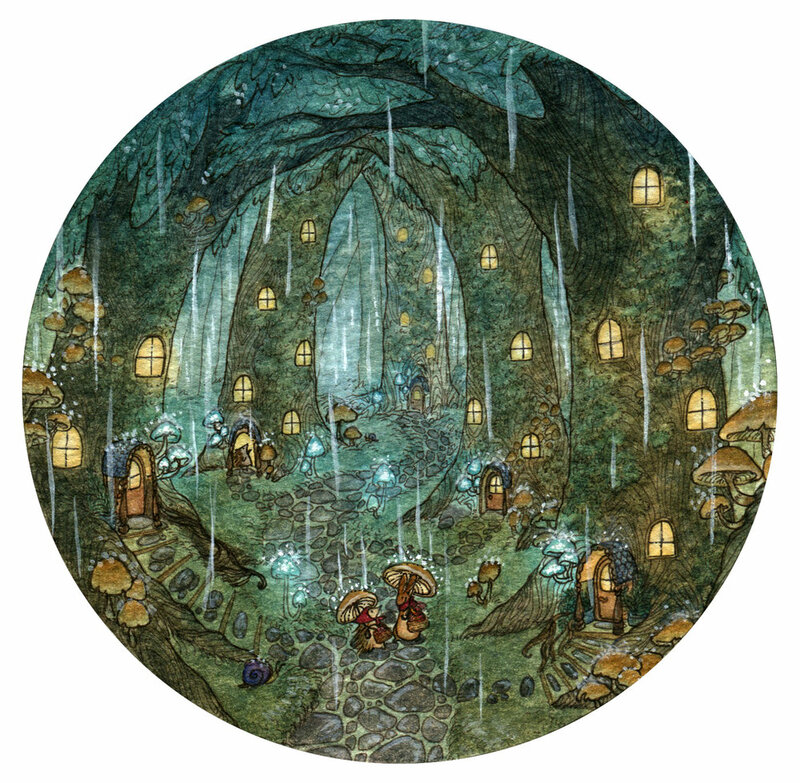 And as it’s a rather rainy day today (which I adore), the rainy mushroom village seemed a perfect choice. Since my health limits me from getting out as much as I’d like (especially to hike), I’ve enjoyed painting these little villages as a way to explore all the pretty and magical natural places I’d love to visit. As a child, I always played outside, making little houses and villages for my small animal toys, and it was lovely reliving those memories as I painted. In a way, I’m still playing those same imaginative games, only now with watercolors! These are small and easy paintings to undertake, done with relatively simple techniques, so feel free to use this as a guide and paint your own little village! I’d love to see where your imagination takes you. First, I trace a 6 inch circle using a candle lid to trace (bowls and baking canisters work well too). I like working in circles, as it’s a more organic and peaceful shape to me, but you can use squares, diamonds, or any other shape you like! I’m quite a messy sketcher (this is actually rather neat for me), since in painting, the sketch is usually quickly obscured. But since this will be inked, I wanted to give myself a few more guides to follow. Using a sepia .005 pen (I like Sakura Pigma Micron pens), I inked the whole scene, down to the teeny tiniest details. I like using sepia ink because it means the lines aren’t quite as harsh as with black, but you still get good definition. Generally I don’t like inking paintings, as it’s rather like cheating in my mind, since the ink defines the edges for you, rather than forcing you to clarify them through light and shadow. But, inking allows me to keep these paintings relatively quick and easy, since I don’t need to render every aspect with paint alone. But that’s just my own personal preference and style! This is where the fun starts! Using watercolors, I painted a gradient wash over the whole scene, starting with an indigo/marine blue at the top and gradually shifting to an undersea green/subdued bluish green at the bottom. I like starting with some sort of overall gradient (oftentimes I’ll put the lighter/warmer color at the center, and the darker/cooler color at the edges, though I didn’t here), as it helps unify the piece from the very beginning, and sets the visual mood. While the wash was still wet, I dabbed it with a damp sea sponge (a crumpled up paper towel will work in a pinch) for a nice bit of texture. This is an optional step, but I like the overall effect it gives. Then, dampening a small sea sponge (a damp bit of paper towel will work too), I lifted the color from all my light sources, in this case, the windows and glowy mushrooms. I also lifted the color from the little animals with umbrellas, as I wanted them to be brighter/more in focus. Next, I let the painting dry for an hour or two (while I watched some Great British Baking Show, made some more tea, and took a nap). When using such heavy washes, it’s important to let the painting dry completely between stages to keep your colors from bleeding together and becoming muddy. After the painting was completely dry, I went back in to start adding color to my light sources. Generally, I like warm light in paintings, as it looks glowier and cozier (and thus, more visually inviting), but bioluminescent mushrooms tend to be cooler and more aqua in color, so I took my cue from nature. 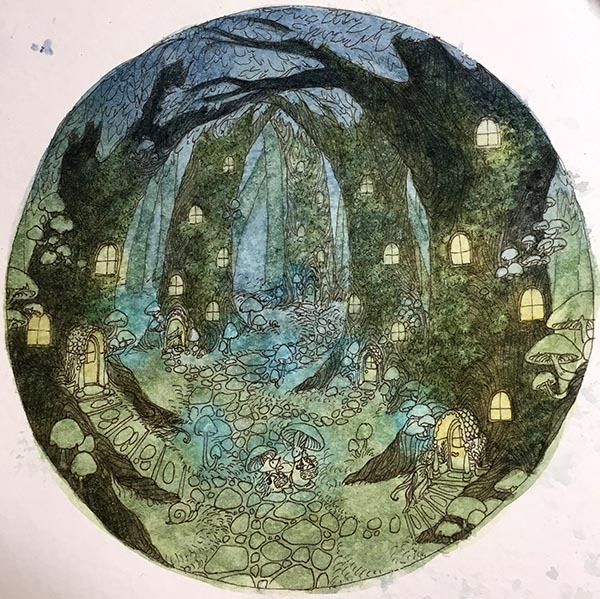 I like keeping the light washes rather wide and messy at this stage, as it helps give the impression of the light glowing, as it will infuse into the colors around it (such as the yellow window lights lightening the greenish brown of the tree trunks in the next stage). Painting light is a fun puzzle: figuring out where the light would fall, what color it would be, and what it might reflect off of. In this painting, I kept the light washes quite simple, but often I enjoy adding many colors to my light sources (like a circular gradient, where the inside is light yellow/white, moving to gold/orange, and finally to a soft rose madder on the outer edges). But since I wanted this village to be a bit rainy and dark, and because there are so many light sources, I chose to keep the light washes simple. Generally, things closer to the foreground look darker, while things farther away appear lighter. This is an easy way to communicate perspective in your painting and thus break up the visual plane. You want your viewer to be able to wander through your painting, getting lost in its world, and this is a key way to achieve that. In this case, it meant painting my foreground trees a darker greenish brown than the trees in the distance, which are only slightly lighter than the background. I also tried to lighten the bark around the windows a bit, adding more greenish-yellow to the mixture to communicate the glowing lights. This is also when I started adding greenish blobs of moss to the trees to further that “rainy day” feel. The moss closest to the windows is more of a yellow-green, while the moss further away from the light is more of a bluish or turquoise-green. Mostly, I just really like moss. For me, this is the most fun part. This is when I finished adding all the colors of the scene: the green of the grass, the grey-violet cobblestones, the brown mushrooms, and the warm brown doors with indigo eaves. The little animals were one of the last things I painted, as I wanted their colors to stand out bright and vivid (without the risk of getting muddied during previous washes). Also, by now I knew what colors they need to wear in order to best stand out, while still remaining a homogeneous part of the painting. Before I added the raindrops, I decided to re-ink the main trees and animals with my same sepia pen. Using so many dark/heavy washes had faded my original ink lines, and I wanted a bit more definition. But, I only re-inked the outlines of the trees, windows, etc. and left the inked texture of the tree bark and all the little details alone, as I wanted them to blend in a bit more. Finally, the last step for this painting was using opaque white gouache to paint the rain drops and little splashes. When it comes to these sorts of finishing details, especially done in white/bright gouache (which tends to stain if you try and scrub it off), I’ve found that less is more. I also used a watered down white gouache to add some reflections to the cobblestones, making them look wet and slippery. Then I dotted a bit of white gouache at the center of each light source to make it look even brighter and more glowy. And that’s it, you’re done! After I scanned the image, I cleaned it up in Photoshop a bit (making the circle crisp and clean and adjusting the colors to match the original), but that’s a completely optional step. The most important thing to remember with these little paintings is to have fun and enjoy the process. Let yourself play! Because play, I believe, is one of the best ways to grow (especially as an artist). Since my last post about tending to the garden of the novel, I have been doing a great deal more novel gardening (i.e. revising and rewriting), some actual gardening, and thinking a great deal about ways to cultivate growth and positive change in the wild spaces of writing. In the spring, my sweet husband made me two small herb gardens in old metal tubs, since we live in a rented townhouse and thus can’t plant an actual garden just yet. I’ve already harvested herbs from them several times, hanging the fragrant bundles in my kitchen to dry, and I’m already looking forward to cooking with them all winter long. It then occurred to me that sometimes I need to trim back parts of my novel and let the bundles rest for a bit, so that I can use them later on. Not only does this pare a scene down to its essentials and keep it from interfering with its neighbors, sometimes the extra bits can be put aside for later use. I enjoy using Scrivener when working on novels, partly because it makes organization so easy, not only for the novel itself, but also for all the research, notes, etc. that go with it. A bit like a garden shed nestled in a back corner. I am not, by nature, an organized person. While this drives Daniel crazy, I quite enjoy running on chaos most of the time. However, I’m working hard to become more organized when it comes to my novels, as a bit of organization and planning at the beginning can mean far less revising and rewriting later on (as I’ve learned the hard way). In tidying my novel “shed” (all the behind the scenes work), I’ve created a few different bins into which to sort things I’ve either cut or dug up from my books. For each, I created a separate folder in my Scrivener project, as well as a few notebooks in which to jot ideas outside of the garden proper. This is by no means a definitive system (it’s hardly a system at all), simply what I’ve found works best for me. For this season anyway. Some days we are blessed to write page after page of brilliant stuff. The flowers bloom, the sun shines, and the birds all break out in glorious song. But more often than not, at least for me, when I sit down to work on a book, it feels like I’m slogging out into the garden in heavy rain, my wellies sticking in the mud, and nothing is growing. So I write the weeds, then put them in my compost bin. This can be a depressing process, especially if it goes on for weeks and months, but it’s a necessary one. I believe in writing every day. Even if that means writing weeding compost stuff. Because the compost shows that I’ve been working through it. I choose to believe that nothing is wasted. I choose to see my compost bin as proof that I’m willing to put in the hard work day after day, and to really tackle the questions and problems of the book in a deep and meaningful way. For the last six years, I’ve worked on and off on a YA fantasy trilogy. I was 75% of the way through the second book when I realized none of it was working. The books and characters had changed so much through a half-dozen revisions that I no longer recognized them. The plot felt disconnected, the themes buried under half-hearted attempts to make the books more “commercial,” and my inspiration had long gone stale. So, I threw the books into the compost bin and decided to start over, combining the ideas of both books into one new novel. Was it an easy decision? Not in the slightest. Did it hurt? You betcha. But as soon as I made the decision to start over, with a freshly tilled garden plot (pun intended), I found inspiration rushing back to me, begging to be planted. The two composted books are providing excellent fertilizer for the new novel; they’re helping nurture my seedling ideas and questions, so that they can grow into a garden so full of life it one day will become a forest of its own. In the midst of all this, I have realized once again the necessity of staying open. Open to new ideas, directions, and inspirations. Open to seeing what you once thought of as a weed as a beautiful flower. Open to letting yourself try new things and experimenting in your garden. Once I let myself be open to the possibility of starting over, my inspiration began to come back to life. I believe that openness is a choice. It can start with a small choice to try rewriting a scene from another character’s perspective. Or to play around with a new setting and see how it influences your characters and their decisions. Openness is a sum of small choices. Such as my choice to view starting over as an opportunity to have fun and start something wonderful growing, rather than just slashing and burning my old book gardens and letting that negativity and resentment fester. Of course, I’m still trying to preserve a few clippings and seedlings from the previous two books. Maybe they’ll take and maybe they won’t. But until such time as I find the perfect spot to replant them, they’re hanging out in my garden shed in their own little area. This is what I refer to as my “To Root” bin. Here I’ll put bits of writing that spark an idea, emotion, etc. but I don’t know quite where they go, or how they fit in with the novel as a whole. So I set them aside in the greenhouse to grow on their own for a bit, much like putting clippings in water on the kitchen windowsill for a month or two to root. I’ll often go into the greenhouse and pick one of these seedlings as a starting point for my morning writing practice, or if I’m stuck and need some fresh inspiration. Often times the seedlings will grow up and go into different gardens entirely, and that’s fine too. I also keep a greenhouse notebook, where I jot down interesting ideas that don’t correspond to a particular project yet. Sometimes these will be ideas for future books, or just something I think would be fun to write about. The notes can be anything from a word or two to whole sentences or bits of dialogue that might pop in my mind. Then, generally owing to my own scattered mind, I’ll forget about them for a while, during which time they can germinate and sprout if they have enough energy. If not? Into the compost bin they go. It might sound naive or idealistic, but because I want my books to be deeply positive things, I believe that writing them should be deeply positive experiences as well. I wish to incorporate nurturing practices in every step of the journey, both for the sake of my books and my own creativity. This doesn’t mean that there won’t be hard work, challenges, and failures along the way, but it means that I can choose to see them as opportunities, rather than disappointments. Whatever my garden grows into, I plan to enjoy it, and to celebrate the journey as much as the end result. I have been lost in the wilderness of my current novel (adult literary fiction) for some time now, overwhelmed by the daunting process of revising. Having not had a formal education in writing, I've been reading every revision guide and piece of authorial advice I can get my hands on. And it has made me so upset to see so many well-respected writers and editors talk about "fighting," "breaking," and "attacking" their writing when they revise, as if it's some monster to be defeated. "Kill your darlings" they say, "make the manuscript bleed." What of the pieces of ourselves and our hearts that live in that manuscript? Are we expected to put part of ourselves to death every time we have to revise? And then it hit me, why can't revising instead be a positive process? I have a weakness for British gardening shows. It's no secret that I'll take Monty Don and a quaint cottage garden over a high-stakes drama any day. So while watching ordinary gardeners turning their unused, weed-ridden gardens into truly delightful spaces, I thought, why can't I do this with my novel? For me, creativity and creation are deeply positive things. My end goal, no matter whether it's a painting or a book, is plant the seed of something positive, whether it's hope or joy or gratitude, etc. So it seems only natural to me that revising and editing (both firmly a part of the creative process) should follow suit, should also be positive. Of course, if you're overhauling a garden, the first step is usually to clear out the space. Cut back the dead prose, the passages with no life or energy, that are no longer working for your new vision or your new season of writing. You must make room for new growth and new ideas. Yes, this means a lot of hard work, and sure, on the surface it can seem like a violent process: slashing and digging up all the weed-ridden info dumps and dull descriptions, but it is also invigorating. You're not destroying, you're creating space. Space for yourself, for your story, for your reader's experience. You're pruning back scenes to let the action/characters/etc. shine through. Less is often more in gardening and in writing: you must maximize the space, make full use of the literary form you're utilizing. I don't exactly have a green thumb, but I quite enjoy growing roses. And if you want your rose bushes to keep blooming all season, you must continually trim off the dead blooms; roses thrive on new growth. And I believe, so do novels. Both can be beautiful, fragrant gems, but as they say, every rose has its thorns. Which is to say that the revision process is never an easy or painless one. My advice: wear thick gloves, don't be afraid of a few cuts, and go in anyway, armed with purpose and determination. You were brave enough to write a novel, you are brave enough to revise it. Books are surprisingly hardy creatures. Like trees, if they're made of tough enough stuff, they can survive the worst of storms and continue to grow and thrive. They need room to grow as well as sunlight and water. In your novel, make space for new perspectives, or for ideas you plant to germinate and grow. Cram too many ideas together and they'll suffer, fighting with each other for the limited resources of the reader's attention and belief. I like to imagine working on your plot structure like landscaping a garden, setting a clear narrative path for the reader to wander down and enjoy all that your novel has to offer. Let them admire your beds of character: filled with all sorts of disparate plantings that come together to create a well-rounded and interesting whole. Allow them to stop and sniff the lovely aroma of your prose, notice the ingenious layout of your plot, and surprise them with hidden delights every step of the way. Finally, I believe that books and the characters in them take on lives of their own. As such, you must allow them to grow. Sometimes this means not hovering over them with spade and pruning sheers every minute of the day, or not fertilizing them until their tender roots start to burn, but simply walking away, and letting them get on with it. It may take a few seasons, but growth takes time. Be patient and don't give up. Soon you will have created a garden that can be carried anywhere and enjoyed by readers the world over. I believe in you. As many of you know, I've been fighting major illness for a long time, illness which suddenly took a nose-dive this past autumn. This coincided with my finishing two novels in two months, and meant that I started 2018 physically, mentally, and emotionally exhausted. So I started painting. Nothing big, just little doodly paintings that I'd work on during lunch or in the evenings. But they sparked something, and I soon found myself painting in every spare moment. I went back and forth to the hospital for more and more tests, and at home struggled just to perform normal household tasks, like cooking and getting out of chairs. It was around this time that I began craving gardens. I yearned for sunshine, fresh air, and most of all, plants. Some deep and essential part of me needed to be beneath the trees, to feel soft moss under my feet, and see tender bulbs begin to bloom. But with my health the way it was, I could no longer just go for a walk or a hike in the mountains, as I used to. So I decided to bring the outdoors indoors. Sitting at my desk with my paintbrush in hand, I began to dream of rambling cottage gardens and allotments filled with vegetables and herbs. I dreamed of roses climbing over old stone walls and snowdrops peeking out beds of moss deep in the forest. As we live in a small townhouse, I couldn't have a real garden, but with a little paint and imagination, I could create any garden I dreamed of. Tiny gardens that would fit in, say, a teacup. A cup of hope and sunshine, dainty enough to fit in the smallest of spaces. Being Very Sick, I have a hard time finding hope in great quantities. 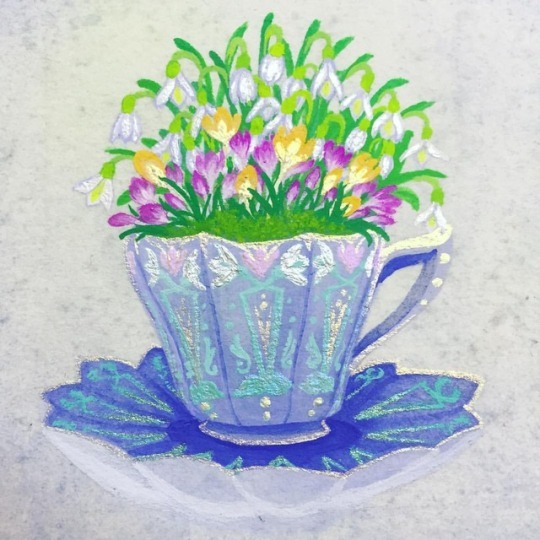 But through my little gardens, I've found I can create just enough to fill a teacup. So for now, I'll take my optimism one cup-full at a time. Before I began my master's degree in illustration, I had had no formal training in art. And while being self-taught does come with certain advantages, I quickly realized how much I didn't know about technique, theory, design, etc. Even now, I feel like I'm only just beginning to delve into my craft and learn its intricacies. And what an adventure it is to learn! In my first critique sessions in art school, I was overwhelmed by all the terms I didn't know. Or if I knew them, I had no idea how to execute them in my own work. Texture? Tangents? Golden thing-a-ma-jigs? In light of that, I thought that I'd start the New Year off with some more practical blog posts about techniques, terms, and simple ways to improve your art. First up: texture! Texture adds richness and depth to your painting, as well as making the surfaces therein feel more tactile and therefore real. Paintings are like the Velveteen Rabbit, they all yearn to be real. And no matter the style or subject matter, it's always good to anchor some part of the painting in reality, to give your viewer somewhere to start and something familiar to hold onto. So that's all well and good, you say, but how do I put texture in my art? 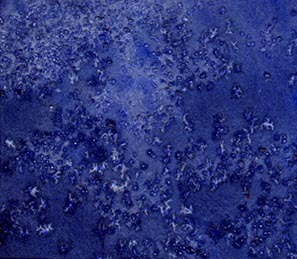 As I'm primarily a watercolorist, I'll share some of my favorite texturing techniques below. There are many, many more ways to insert texture into your art (especially if you work digitally or with mixed media), but many of these painting techniques can be applied using your medium of choice. 1. The damp sponge method. This is exactly what it sounds like: lay down a wash, wait for it to be almost dry (no longer glossy), then dab with a damp sponge (natural sea sponges work best, but in a pinch, a crumpled up paper towel will do) to create cool water spots. I did a more in-depth tutorial a long time ago which you can still find on my tumblr HERE. Again, the name says it all. I've never been a huge fan of this one, since the effects are hard to control (and we all know how much I love control). Basically, lay down a wash (it works better with darker colors) and while the paint is still wet, sprinkle on salt. Coarse sea salt works best, but for the above example, I literally just sprinkled some salt from my little penguin salt-shaker onto a wet wash. Then when it's completely dry, just brush off the salt. This is an easy technique to do in any medium to add a bit of texture. Need to make that basket look like it's actually woven from sticks? Add some hatch lines in a slightly darker color. Want that tunic to look like it's made from rough-spun wool? Hatch lines. Knit patterns on a sweater? You guessed it: hatch lines. Just pick up a small detail brush, and start painting thin lines in one direction, then add some going in a different direction. Super. Easy. Experiment with line weight and stroke to make your hatching even more expressive. It's exactly what it sounds like. Painting with a dry brush. This is a bit harder to do with watercolor, as you have to have some moisture either on your brush or in your pigments in order for them to spread. But a little goes a long way. Too damp? Run the brush over a dry paper towel or the back of your hand a few times to dry it off a bit. The left half of the sample was made by stippling, the right half by doing normal strokes. Fun fact, I used to work designing commercial fabrics. It was a pretty interesting gig, and taught me all about repeats as well as historic pattern design, though I'm happy not to be banging my head against my desk trying to make complex tiny repeats work anymore. Remember, your patterns don't need to be perfect (mine are far from it, for evidence, see above), they just need to break up the monotony of flat-colored surfaces and give them some visual interest. Similar to hatching and dry-brushing this technique is great for painting fur, hair, spines, etc. and making them seem more real. Remember, paintings are like the Velveteen Rabbit, they want to become real. I modeled the left side of this sample after hedgehog spines and first put down a thin wash of burnt sienna for the base, then did a layer of strokes in burnt umber, all going the same direction. Then when that was dry, I went back with a thinned white gouache and put some more spines on top. For more complexity, add more layers of in-between shades (or hide some dull blues or violets in there), just be sure that you can still make out distinct spines, so that it hasn't all run together in one blob. The right side I modeled after fur, and followed the same basic steps as above, just with a thinner brush and short, curving strokes. Remember that fur moves a lot and frequently changes direction. Just look at a dog's face and all the different directions the fur there grows. Then snuggle that dog, because we've reached the end of our tutorial! If you want more practice, challenge yourself to find and paint six different textures (or more!) around your house or in your backyard. Maybe there is some really interesting tree bark outside, or a nice pattern knitted into your favorite sweater, or even lichen-mottled rock surfaces. Remember, inspiration is everywhere! If you have any questions or would like to make requests for my next topics, just let me know if the comments below. Happy painting! It's no secret that when it comes to painting, I'm obsessed. Recently, I spent two whole weeks thinking waves, painting studies of waves, reading about waves, and generally trying to get my mind to move in more wave-y ways. I meditated on the ocean, studied the frothy white lace that rides atop seawater, and did a lot of swimming, imagining I was a big rock with waves crashing against me, or that I was a seal, gliding through a stormy sea. All this in preparation for one painting for an upcoming book. I realize I'm more than a little crazy, but for me, this is all just part of my process. When it comes to painting, I'm all in: putting my heart, mind, and spirit in everything I do. It's exhausting, sure, but I wouldn't have it any other way. I love getting to really dig into a painting. I love immersing myself in the colors, the detailed brushwork, the way the water interacts with the pigments. I think my "immersion method" probably stems from a childhood of having very few friends, being bored to tears in school, and so really throwing myself into my art. It was a refuge, an escape, a world in which I could create anything I wanted. I learned to comfort myself with color, to distract myself with detail. Recently I've been thinking a lot about my creative process and its rituals. I've always been fascinated by creative people's rituals: how they get their juices flowing, and how they keep that energy up. Funnily enough, I feel like I have more structured rituals when it comes to my writing. When I sit down to write, I'll light a candle (usually something that smells like a winter forest: juniper, spruce, pine, and snow), have a mug of hot tea ready to go, and play classical music (usually Ravel or Debussy). Sometimes I'll comb through collections of notes or inspirational images relevant to the project (hello, Pinterest!). Other times, I'll just sit down and start hammering out scenes. Painting is much looser (and easier) for me: I put on some sort of interesting music, or maybe a show (I love watching documentaries, especially food-related ones while I work), maybe do some light stretching or take a short walk outside. Sometimes I'll even wear certain jewelry or perfume to help myself feel more in the creative spirit. I think these rituals are part Pavlovian cue, part distraction to coax my subconscious or intuitive mind out of hiding. And as my inspiration is constantly changing, I find that the rituals to unlock said inspiration must change too. It's a constant journey of exploration, of finding new things that awaken my curiosity and ignite my creative spirit. Who knows where it will lead next? 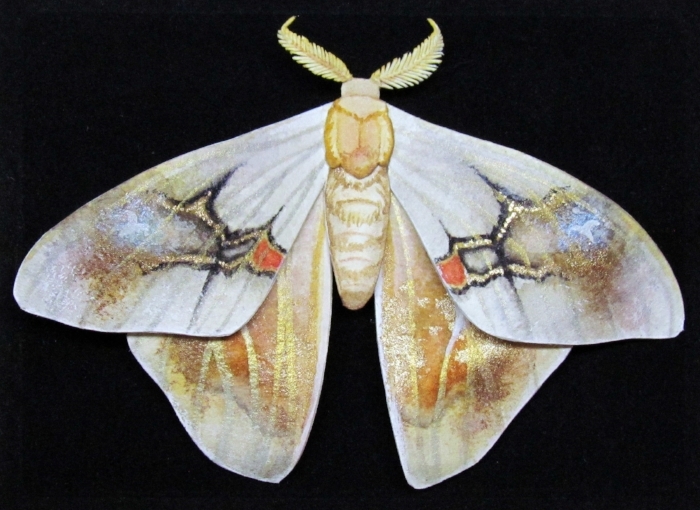 Paper moths are actually fairly easy to make. They are comprised of simple shapes, so the key to making them look "real" is a keen eye for observation when it comes to painting the wings. For this tutorial, I chose a Spanish luna moth, as their wing patterns are quite straightforward and it doesn't take much to make these Art Nouveau-esque beauties look ready to flutter away! 1. Find a good reference picture (or 2-3) of your moth. You'll be consulting these reference pictures frequently, so make sure you can see the details and colors clearly. 2. Sketch and cut a template for half of the moth, then trace it onto plain white watercolor paper. Cut out with an x-acto knife, making sure your edges are clean and sharp. Set aside the body and head for now. 3. Start layering on base washes of color for the wings. Almost all moth wings are gradients at their simplest, and even if they're not, you can fudge it a bit to add visual interest. For the Spanish luna moth, the wings go from a mix of greenish aqua near the body to a very light, yellowy green at the edges. 4. Start tracing the stained glass wing patterns with a light burnt sepia. You'll darken these up later, but sketching them in a lighter brown makes them easier to erase if you happen to flub up (which I always do). Use that same burnt sepia to trace the outsides of the wings. 5. All right, time to break out your tiny brushes. Outline the burnt sepia edges with a dark burnt umber (pure black is too harsh) and use a mix of burnt umber and ultramarine blue to go over the inside lines. Also outline the "eyes" and the half-circle shapes inside. On the outer edges of the wings, you can layer a mix of carmine red and burnt umber over the burnt sepia to give it more of a reddish tint and help the dark outlines blend more easily. 6. Your moth is almost done! Add the dark stripes at the edges of the wings, mimicking their patterns in your reference photo. It's hard to get wings perfectly symmetrical, so just try your best and line them up close together now and then to check your progress. Add a tinge of ocher and carmine to the part of the top wings closest to the body. Then, in the "window panes" next to them (on both top and bottom), add just a touch of cool mint (again, this just gives the wings a bit of extra dimension and visual interest). Also add small half circles of white to the "eyes" to help them pop. 7. If you're feeling up for a challenge, cut tiny fringe onto the antennae with a fine x-acto knife. If not, don't worry, you can simply paint it in. 8. Paint the head and body. Different moths have different body structures and segments, but here I've chosen to simplify the body so that it doesn't compete with the intricate wings. Give your moth some big bug eyes and make sure the paint gets into all the fringe of the antennae. 9. Now it's time to assemble your moth! This is fairly straightforward, with wings glued under the body. On the back, I like to add a rectangle of the same watercolor paper to add stability, as these tend to be quite delicate creatures. You won't see the back of the moth if you mount it in a shadowbox etc., so don't worry if it's messy. 10. Holding the moth's body firmly (where you just glued everything together), start to bend and shape its wings. This way, when it's mounted, it will seem to hover rather than simply laying flat. 11. Very gently curl the moth's antennae around the slender end of a paintbrush. Be especially careful if you've cut fringe into them, as it tends to break rather easily. 12. OPTIONAL: Add touches of iridescent paint to the moth's wings to help give it a bit more dimension and pizzazz. Be careful not to over indulge on iridescent accents, however, as you still want your moth to look realistic. Here I've used some iridescent green and yellow pigments from Finetec. 13. Congratulations, your moth is all finished! I find these are best mounted in shallow shadow boxes (that can usually be found at the craft store), so that they can be displayed easily without risking being damaged. If you want to, give your moth a name. Maybe a personality. Or maybe, like me, you've been happily chatting to your moth this whole time and now have a new friend to enjoy! I paint and write because I have to. In my mind, there is no other option. It's therapeutic in a way, self-indulgent in another. Creating like this is my passion and my whole life I have been drawn to it, like a moth to flame. I began making moths just for myself: for the relaxation and meditative aspects of it. It's quite soothing, making these little creatures. I have long admired taxidermy moths and butterflies, but wanted to find a way to preserve their beauty with no creatures being harmed/killed (though I know many mounted specimens are found already dead). Plus, I thought painting moths would be a good challenge of technical skill (an area in which I continuously need improvement). The Penguin Dictionary of Symbols notes the unique dichotomy of moths, that they are symbols both "of the soul seeking the godhead...consumed by a mystical love" and "of faithless frivolity." Both are represented by the image of the moth fluttering around the candle frame until its wings burn. In a more personal sense, moths to me are representative of creativity: that I am constantly drawn to the mysterious and divine in it, but that if I'm not careful, I'll burn myself out trying to reach it. I've always felt a certain kinship to moths. We are both most active late at night, when the rest of the world is sleeping. And though we live in a world of darkness, we seem to expend all our energy seeking out beauty and light. We're silly, dusty creatures who are continually evolving, even if right now we're just cocoon goo. But my moths make me happy. They are peaceful, contented reminders of creative potential, of metamorphosis, of the beauty found in darkness. As many of you know, I got married late last year, and with that came a change of name. While this has mostly been a matter of paperwork, it also gives me the opportunity to re-brand and redesign my site/cards/etc. (which I think is a healthy thing to do about once a year anyway). So though I go by K. A. K. Lecky now, the important things won't change. I will continue to illustrate and to write (I might feature more of the latter on my site this year). And with any luck, I will also continue to grow and change as an artist. This won't be a dramatic change, mind you. I still illustrate for the same markets and will continue to do so, but I feel my personal aesthetic has shifted a good deal. After hearing a talk last fall by the brilliant Giuseppe Castellano, art director at Penguin, I feel somehow as if I have permission to make the sort of art I want, even if it's not the cute and colorful sort normally thought of as for children's books. His main point was to make good art. That's all. It can be dark, or strange, or serious; it doesn't matter, as long as it's good art. That has really stuck with me and in a sense has allowed me to follow my curiosity in ways which are both personally meaningful and challenging for me. I think as artists, one of the greatest battles we fight is between producing what we feel naturally drawn to create and what we think other people want. When in reality, it's my belief that people don't know what they want. So it's really a losing battle from the start. So this year, I'm challenging myself to say "what is it that I truly want to create?" and "what has meaning for me?" instead of "what will sell?" or "what will be popular?". Because the latter is built on little more than guesswork. Only with the former can I hope to communicate something different, something meaningful. I'll try to be better with blog posts in 2017; are there any topics you'd particularly like me to cover? Questions you'd like me to mull over? Let me know here or send me an email at kakleckyillustration@gmail.com . As many of you know, next week I fly to the Arctic to marry my best friend, love of my life, and fellow illustrator Daniel Lecky. We'll be traveling to northern Norway and hiking through the Lofoten Islands, which somehow seemed a fitting wedding adventure after getting engaged in the German Alps overlooking Schloss Neuschwanstein. To be perfectly frank, I have hated wedding planning. Planning trips? Great! Planning weddings? Not so much. But there has been one piece that Daniel and I have really enjoyed working on together: the paper goods! Since we're both professional artists, we had a lot of ideas about how we wanted our invitations, save-the-dates, etc. to look, and how we could best collaborate on them. We designed our save-the-dates pretty soon after getting engaged (well before we knew what sort of style we wanted for the wedding), and so tried to have them really reflect our personalities: kids at heart who love adventuring together outdoors. We both grew up with Calvin & Hobbes, and love it just as much now as we did then, so it seemed a natural choice of style. Plus, the comic setup let us tell more of a story, which we really liked. Daniel did all of the sketching and inking, while I did the painting/color. It was a fun experiment, trying to copy someone else's watercolor style like that! Most of all though, we enjoyed getting to work together on a project, which, having such different styles and types of work, is a rare occurrence. For our invitations, I wanted to do some kind of papercutting, while still involving Daniel's sleek design sensibilities. Our original wedding venue was a gorgeously restored 1920s Art Deco building, so as you can see, we drew heavily on that glamorous Deco style for our invites. And while the venue unfortunately went out of business 5 months before our wedding (giving us some major panic and forcing very hasty replanning! ), we still liked the look of the sumptuous fur and classy tuxedo, and decided to use the design anyway, just replacing the background. And of course, our cat, Arthur, wanted to be included too, so we set him to work guarding the RSVPs. While I know that a lot of people try to have all their paper goods coordinate in design, we decided just to have fun with it and do a little bit of everything. Also, since we've both been working our normal jobs throughout the entire process, we only had time for so much. All in all, we had fun with it and had fun doing it together, which at the end of the day, is what matters most. I'll post another update soon about my coming name change/rebranding, so stay tuned! I am a very seasonal person. I find my creative energies waxing and waning with the growth of the plants, the temperatures outside, and the natural palettes of the earth. That said, summer is definitely my period of "creative hibernation." Maybe it's the intense heat and humidity of the Southeastern United States, maybe it's the bugs and sweat, but every year when summer rolls around, I find myself creatively exhausted. I'm definitely a cold weather person! Different seasons bring different sorts of inspiration for me. For instance, I find I do the most writing in fall and early winter, while late winter/spring are good for editing. Similarly, I seem to be particularly inspired with papercuttings in that period of Indian summer: the tail end of August through the middle of September. Then I revert back to more traditional watercolors as the trees turn. These aren't "rules" of mine by any means, simply observations of my own particular artistic rhythms. Of course, no matter the season, I have to complete my normal work; but isn't it nice when preference and obligation sync up? Everyone goes through creative slumps or "down-times" now and then (for me, it's easier to call them "down-times" than "blocks" as the latter tends to be quite a frightening word for creatives). But I think it's important to keep working through them: drawing/painting every day, learning new skills, and sharpening existing techniques. Because deadlines don't care about how you're feeling. Since I work primarily in watercolors, I sketch quite lightly, then tap the sketch down with a kneaded eraser which accomplishes two things: 1) it lightens the sketch so that it won't show in the finished painting and 2) removes excess graphite so that the paint pigments don't become muddied. I sketch like a painter, which is to say minimally and loosely, since all the real work for me comes later (and a lot of details are lost in the first few washes anyway). This also gives me the freedom to further refine the image as I go. My one exception is the face: I'll include most of the facial lines/details in my sketch, since a very small change here can drastically alter the image (nose too long, eyes too small/not even, etc.). 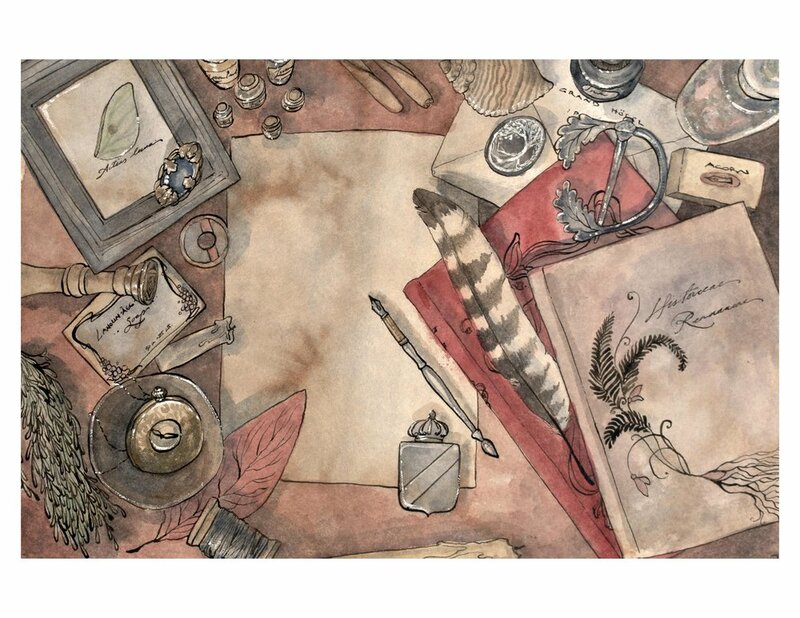 There are lots of "rules" for mixed media (what goes down first, how to layer and combine media, etc.). For the sake of brevity however, I'll stick to explaining just my own process. With watercolor, lay down your lightest shades first, as well as the areas furthest back in the painting (usually, your background). Which, I completely disregard here. That's the funny thing about art: there are all kinds of "rules," but you have to learn the rules in order to break them (I'm a big believer in this, especially when it comes to things like realism, anatomy, and perspective). Since the selkie will be painted in gouache, I don't have to be so careful about preserving her outlines. If you want to be really careful, you can apply masking fluid to the figure. I, however, am not that tidy. I also like doing a wide background wash, as it helps tone the figure and keep her palette harmonious with the background colors. 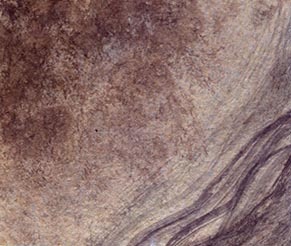 The scan below actually shows several washes, adding different colors each time. Watercolor takes a bit of layering to darken up/make really vivid, so for the edges, I applied several washes of deep ultramarine + burnt umber, with a mix of deep ultramarine + viridian + aqua for the middle. The great beauty of watercolor, for me, comes from all the colors you can hide in one area. If you look closely, you can spy tinges of purple, rose madder, and burnt umber in the background. I also took the opportunity here to add some texture to the background with a sponge. This is a very old technique, used by illustrators like Edmund Dulac and Arthur Rackham, but can be quite tricky as it relies on precise dry times (I have a separate tutorial for it here). I also sponged away the pigment at the focal point of the painting: the selkie's face to help it stand out more. 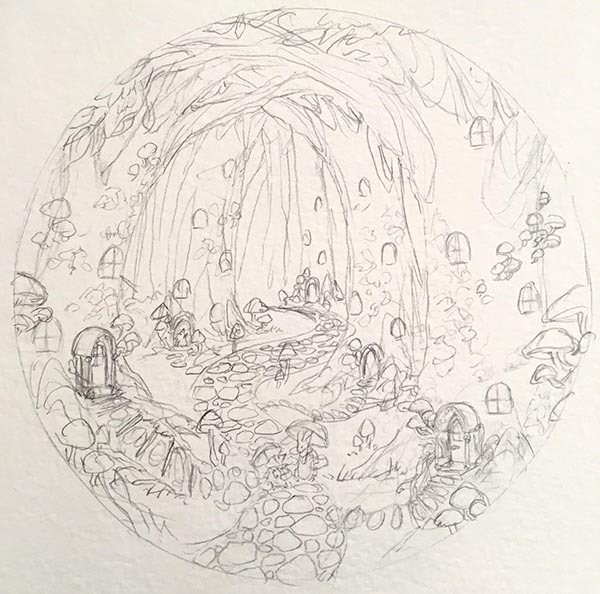 In doing so many dark background washes, I almost completely lost my sketch (thankfully I had scanned it earlier, so I could refer back to it as needed). However, I can see the basic shapes, such as the selkie's face and the curve of her tail, which is enough for me to get started. This is why I never spend too long on the sketch. Using gouache, I lay down the base colors for the selkie: her skin, sweater, and tail. Then, I start marking out her face and adding the making the gradient for her hair. Once the base colors and shadows are painted, I start adding details, such as the cabling on her sweater, strands of her hair, and tail spots. I also add highlights to her face and hair to help them pop more. If this was a real illustration, instead of just a doodle painting, I would've already planned out the image and colors with thumbnails and color comps. However, since I didn't do any planning, I decided to scan it and do some test runs of different colors/rock placements in Photoshop. This allows me to play with endless different options without affecting my painting. This is an especially helpful tool with watercolor, as there's no going back once you've made a mark on the paper! If you covered the foreground (in this case, the selkie) with masking fluid or knew that you were going to use opaque acrylic gouache for the figure, you could've done this step after completing the background washes. But again, since I more or less made this up as I went, I finished the background pattern towards the end. In this case, I added rounded diamond shapes in gradients to represent the flowing Arctic waters. I also added the rocks with acrylic gouache and painted patterns on them with watered down gouache in a light mint. To finish off the painting, I added some white highlights to her hair, and painted ripples in the water with a more watered down white. Overall the painting still has plenty of problems, but since it's just an un-planned doodle, I'll let it stand as is. There is a very fine line between putting enough work into a painting and knowing when to stop. Unfortunately, this is one of those things that is best learned by doing (and messing up plenty!). 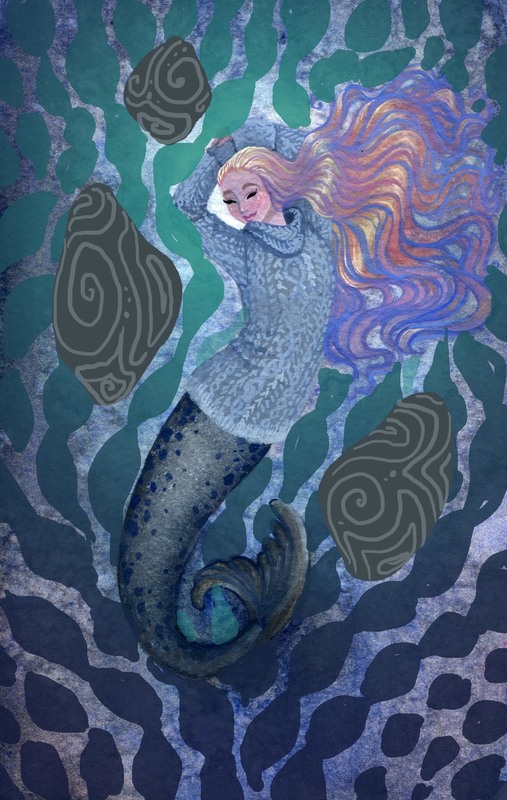 And even if I'm not totally satisfied with the painting, I still accomplished my goals with it: to visually think about Arctic selkies and how to represent them and to have fun! I love looking at other artists' sketchbooks, whether in person or online, via social media platforms like tumblr or instagram. Sketches give a unique look into an artist's thought process and method. While some sketch in pencil, many more take their sketches to the next level with ink+brush, gouache, or charcoal on toned paper (to name but a few). This change in media may seem small, but it can have a huge impact on your sketches and really take your "silly doodles" to the next level! While cultivating a portfolio, the goal is always to make your work look professional (fake it 'til you make it, right?). And with social media becoming a larger and larger part of marketing and making connections, it's important to carry that professionalism over into the sketches and "rough work" you show too. Sure, your lines can still be loose and messy, but a simple change of medium can help your doodles really shine. Lately I've been doing more gouache sketches. These quick and simple paintings help me focus more on shape, color, and pattern since I don't use any line work etc. Below is a step-by-step look at the process I use. For this painting, I used acrylic gouache, which dries quite quickly, forcing me to work fast and really commit to the colors and shapes I put down. 1. I start off with a wash of aqua for the base. Some artists prefer to put down their sketch layer first and then seal it in with a very light wash, but since I'm using opaque acrylic gouache, I decided to put the sketch on top of the color once it was dry. This aqua is actually straight from the tube, which made it easier to clean up edges/stray marks at the end. While I rarely use color straight from the tube, I take exception when I want a painting to be A) extra colorful/bright or B) fast. I keep my sketches minimal and very light--blotting them with a kneaded eraser so that they're barely visible. (This comes from working primarily in watercolor, where you want your sketch to be so faint it's almost invisible.) Also, if you have too much graphite in your sketch, your paints will pick up its grey pigment. 2. Starting with the objects in the very back of the painting, I start to block in the colors. I decided to have the pineapple be a gradient of yellow to orange/coral so that the light-colored dole whip (the midground) would stand out more. Since I'm painting yellows/oranges on blue, I had to use a few coats to get the color pure and not so muddy looking. 3. Start playing around with patterns/textures for your background object(s). Remember that it will be easier to experiment now, before you paint the top layers (in this case, the bird). Then I block in the dole whip with light, buttery yellows, starting to get that swirled look with my brushstrokes. 4. Add more detail to your midground (dole whip), and then block in the colors of the foreground (bird). As with the pineapple, since I painted a white bird on a blue background, it took several coats to get the color bright and pure like I wanted. I also gave Miss Birdie an eye, because I find it much easier to paint things that "have a soul," so to speak. People/animals/etc. really come to life once you give them eyes; it's usually at this stage that they'll start telling me who they want to be, their personality shining through with every detail and line. 5. Almost done! The more I paint Miss Birdie, the more I come to understand who she is, what kind of personality she has. With each pass, I add more detail to the painting. Remember that detail, like color, can draw your viewer's eye to a certain spot, so try to focus it wisely. Here, I use it to point to both the bird's face and the dole whip. 6. All finished! As you can see, I changed my mind a few times before I arrived at the final painting. Namely, changing the texture on the pineapple and having the birds feathers all separate from the body. The nice thing about acrylic gouache is that, like regular acrylic, you can simply paint over mistakes and keep going (though the paint builds up rather quickly, giving it a distinct texture, unlike acrylic, whose layers tend to lay smooth). Note: This image shows the colors more clearly since it's a scan, rather than a quick phone picture. So the next time you feel like doodling, try adding color, or sketching in a new medium. You never know what happy accidents you may find! So often, people tell me "I wish I could just draw my ideas, but I can't." But the secret is: even professional artists often have a hard time getting the idea or image in their head down on paper. After all, there are no USB cables to connect your brain to a printer, as tempting a thought as that may be sometimes. Ideas and images that come into your imagination tend to be fleeting. It's just part of their nature, I think, as it's part of the nature of creativity. Like I've mentioned in the past, I like to think of creativity as a living, growing organism. And like cats or small children, it never stays still for long, so you have to keep up with it, and develop a system for quickly capturing ideas as they appear. Of course, this system with vary from person to person, so think of the guidelines below as a sort of starting place to play around and see what works best for you. I've also found these steps to be helpful when trying to pin down on paper that elusive image in your mind. And while here, I'm relating these steps to visual art, the basic principles can also be used for writing, music, dance, etc. Make a rough sketch or gesture drawing. It doesn't have to be pretty; as long as you know what you're trying to convey. Color block your image. Just get down the hues you see in your mind, and don't worry about them working perfectly yet; remember, this is just stage one. Value block your image (like color blocking, just with shades of grey). This works particularly well for people who tend to think in black-and-white or have an eye for dramatic lighting (chiaroscuro, anyone?). Each person has their own preferred method for doing this. For instance, being a painter at heart, I work by color, so I'll start by painting large swathes of color either with watercolors or Photoshop (the latter is nice in that it's easily edited), or I'll sketch in very loose, messy strokes. Again, don't limit yourself to only these methods: play around and just have fun with it, seeing what comes easiest to you! Maybe it's making collages, or arranging tiles into patterns. The most important thing is to keep it quick and dirty: getting the basics of your idea down in a couple minutes and in a way that seems natural to you. An inspiration board from a (still unpublished) project. When it comes to art, you can never have too many reference photos. The best are the ones you take yourself (cell phone cameras are great for this, since you can capture interesting details/lighting situations/etc. anywhere you go). Plus, if you're someone who tends to rely heavily on reference photos, using your own photos avoids problems with copyrights and intellectual property rights later on. One of the most helpful things to me when I'm trying to get an image down is finding inspiration images. Usually these are other pieces of art, maybe with a similar palette, or style, or even just a way of drawing noses that I like. I collect entire Pinterest boards fill of inspiration images to flip through when I find myself stuck, but also frequently reference children's books, vintage prints, and museum archives (The National Gallery and Met have amazing online collections, as do many other museums). In Anne Lamott's book Bird by Bird (I really like books on writing, okay? ), she encourages writers to take their stories one step at a time, and not get overwhelmed by the big picture. Most oil and digital painters work through a similar method: they start with very loose sketches and rough blocks of color, and then slowly, work on each part of the painting, adding more detail and clarity with each layer. The idea is to build up the final image with each layer, firming up your idea as you gradually bring your image to life. Maybe you change your mind partway through and decide that it would actually work better if you did this, or altered that. Remember that editing is an essential part of creation! Very few people have the gift of getting it right the first time around (and we don't like those people very much because of it). Most of us mere mortals have to really work at something, let it sit for a while, then come back with fresh eyes, work at it some more, and repeat until done. This is a process that could take hours or could take years (scary, I know). But unless you have a deadline, try and let yourself enjoy the process! So the next time you get a great idea for an illustration, or any sort of creative work really, but feel like you just can't bring it to life or get it down on paper, give these steps a try. Take it one small piece at a time and work your way up to the image or idea as a whole. Be kind to yourself, and remember that mistakes are always allowed; you never know what unexpected opportunities they may bring! There is a photo of the Dalai Lama that I particularly love: he is hunkered down in the passenger seat of a car as a child might be, his hands eagerly clinging to the side of the door, and his face full of wonder. There is such simple and profound joy in his eyes, that I can't help but smile every time I think of it. I think of that photo almost every day when I sit down to paint. I marvel that such joy could come from something as simple as riding in a car, something that to many of us would be considered mundane and dull. It's a poignant reminder to me to enjoy every piece of my paintings, and every step of creating them. I often feel silly, getting so caught up in the beauty of a particular color or the grace of a simple brushstroke, but I have to remind myself that it's okay to be childlike in my wonder. There's a magic in the quotidian, if we let ourselves see it. In my younger days, I read a lot of manga, but the only series that I continue to read (or go back and re-read) is Yotsuba& by Kiyohiko Azuma. The premise of the series is very simple: Yotsuba is a little girl living in Japan with her adopted father and experiencing the many adventures of life (such as puddle stomping and ordering pizza) for the first time. My favorite part of the series, though, is its motto: "Enjoy everything." One of my goals every day is to do just that: enjoy everything! From pouring the water for my tea to cooking meals to seeing how the wind stirs the branches outside my window, and everything in between. Such an attention to detail, a willingness to see the adventure in even the most ordinary of tasks, is something I work had to bring into all of my art. Most of us [unfortunately] don't usually get to go on epic adventures every day, like having tea parties with dragons or taking a hot air balloon around the equator. Kudos to you if you do. But for the rest of us, we have to make do with calmer, more ordinary adventures, like going to the grocery store, waiting at the doctor's office, and the ever-fun game of laundry. But why do these things have to be less exciting or magical than what we read about in books? They're more common, true, but these simple tasks have a beauty all their own, I believe. There can be something very peaceful and zen about folding laundry or seeing produce at the market arranged in colorful stacks. So the next time, you're feeling bored or "normal," take a moment to appreciate the quiet beauty of the world around you. Find grace in even the most minute of movements. And above all else, cultivate gratitude for all these small moments of magic; after all, no one else sees the world quite like you do. I apologize for the long silence on the blog, life has been inordinately busy lately with travelling to Germany, moving, and planning a wedding. Phew! Amidst it all though, I'm still trying to find time to doodle every day. Being plunged head-first in the wedding industry (the magazines, the planning guides, the websites full of expensive foof), I realize just how inundated our society is with desire for material things. Living in a consumer society, we're constantly told how we "need" this or "have to have" that, so much so that we spend all our time lusting over items and not appreciating what we have, or what's more, what we ourselves can create. That's one of the great appeals of art to me: I can create anything I wish, anything I can imagine. There are no budget limitations (unless you're shopping for supplies, that is), no "oh, I don't have the body for that," no limits on travel. I deal with a lot of chronic health issues that force me to follow a pretty strict diet. This results in constant cravings for things I can't have (I'm looking at you, donuts). I mean, it gets bad. So what do I do? I paint pages full of colorful, sprinkle-covered donuts. Weird? Yes. But oddly enough, it helps. Just like when I'm working on book illustrations, I like to paint places I'd like to spend time in: magical forests, cozy cottage homes, wild mountain paths, etc. After all, how can I expect readers to get lost in my illustrations if I myself can't? So the next time you sit down to doodle, but don't know what to draw, think instead about the kind of person you wish you could be, the adventures you wish you could go on, the world you wished you lived in. Because through art, you have the ability to transform not only how you perceive yourself, but how you (and others) view the world around you. Recently, I've been reading Marie Kondo's The Life-Changing Magic of Tidying Up. While I initially started reading the book in hopes of paring down my possessions for an upcoming move, I have found myself transfixed with the simple question she uses when deciding whether or not to keep an item: "Does this spark joy?" And while certainly this is an excellent way to narrow down what physical things you value most, it can also be used in many other situations, namely: art. Does your art spark joy? For years I tried to make art that was marketable and appealing to a wide range of audiences. And along the way, I lost my passion for it. I was so focused on trying to make commercially viable art, that I forgot the reason I had started painting in the first place: which was simply that painting made me happy. Funnily enough, as soon as I started making art that I enjoyed creating and that brought me joy, I found the commercial success for which I had yearned. For many of us, our art is also our work and thus takes up a large portion of our time and energy, but this doesn't mean that we can't still enjoy it. Think back to why you decided to go into art in the first place. Did you constantly doodle in your notebooks in school? Were you always making up stories in your head? Did your limbs ache if you sat still too long, begging you to dance? More than likely, you pursued art because it brought you joy. And, more than likely, your art sparks joy in others too. I have a dear friend who is an incredible dancer and choreographer. When I watch her dance, I am filled with the same feeling that I get when I'm sitting in my studio, absorbed in a wonderful trance of painting. It is a pure and fascinating joy, and I can see her passion and her devotion to her art in every movements. It can be easy, I think, to be so consumed in the process of creating that we forget that the finished art is meant to be seen and enjoyed. That we can, in some sense, share our joy with our audiences, even if we don't know it. That we can choose to create joy in our lives and in our work, and offer up this happiness for others to participate in too. Of course, there are many aspects of your art that will not necessarily bring you joy. For instance, I don't particularly like painting still-lifes or realistic studies of anatomy. Yet, if I ignore these crucial exercises, my art will suffer. Similarly, I greatly dislike bookkeeping and accounting, yet I can't very well skip them simply because they don't bring me joy. I'd be in a very tight spot if I did! I like to call this the "eating your vegetables" principle, where you may not enjoy something (and it may very well feel like choking down raw brussel sprouts), but it's good for you. It's a necessary step to keep growing as an artist and to running a healthy business. The key, at least for me, is to think of the joy of art in terms of the big picture. Since I do illustration for a living, I work on plenty of projects that might not be my personal favorite, such as an assignment to draw cute cans of spinach (you'd be amazed). Yet, even illustrating spinach cans, I can find joy in the fact that I'm getting to do what I love: paint. I am able to take pleasure in working from home and in having a flexible schedule. It's all about silver linings and remembering to view things as a whole, instead of getting caught up in the details of "I don't like this" or "this isn't my style." Naturally, as your reputation as an artist grows, you're able to be more selective about the projects you take on, but it's still good to be able to find the positive in everything. I know I've written before about the importance of artistic play, and this is why. To be able to take even a 5 minute doodle break and in so doing remind yourself how much you love what you do is invaluable. I've often heard the saying "if you love what you do, you'll never work a day in your life," which I don't quite agree with, but I like the sentiment. If you are passionate about your work, and if that work makes you happy, it will show. When I'm asked about working as a professional illustrator, I admit that I quite often work 14 hours a day, 7 days a week, with very few true holidays. Most people make a horrid face and ask how I can do that, week after week, month after month. And the answer, quite simply, is that I love what I do. Painting sparks great joy for me, and I wouldn't trade it for anything.